Preheat oven to 450F Degrees. Lightly mist a baking sheet with olive oil spray. Take your 2 chicken breasts and begin by butterflying them, then completely cut each breast into two thin breasts. Now you have 4 separate, thin chicken breasts. In a gallon size plastic baggie, add the olive oil and chicken breasts. Roll and shake to coat the chicken breasts evenly. In a mixing bowl, combine the breadcrumbs and parmesan cheese, then place on a glass or paper plate. Dip each chicken breasts into the breadcrumb mixture to evenly coat each side. Place on prepared baking sheet and repeat with each chicken breast. Spritz chicken breasts with olive oil spray and bake for 10 minutes, then turn and continue baking 5 minutes or until cooked through. 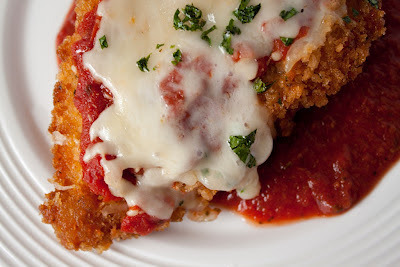 Remove from the oven and spoon spaghetti sauce on each chicken breast, then top with mozzarella cheese. Return to oven and continue baking 5 minutes until cheese is melted. Remove, sprinkle with parsley and serve with a quinoa pasta and a side of veggies!